Last month, Annabelle: Creation director David F. Sandberg announced a contest that asked fans to shoot a short film set within The Conjuring universe. Those who participated had to make a short that felt as though it could fit in with The Conjuring movies that ran two minutes or less, and they had less than a month to make it happen. The winner has been chosen. Filmmaker Julian Terry managed to beat out the competition with his super creepy short called The Nurse, which you can watch for yourself online right now. Julian Terry has released The Nurse online, which is the U.S. winner of the contest. Different winners are going to be selected for the U.K. and Mexico. Terry, for his efforts, is going to get an all-expenses paid trip to Hollywood where he'll meet with New Line Cinema and David F. Sandberg. That doesn't necessarily mean that he is going to wind up directing a movie in The Conjuring franchise or anything like that, but it does represent a nice chance for a young filmmaker to get his foot in the door. 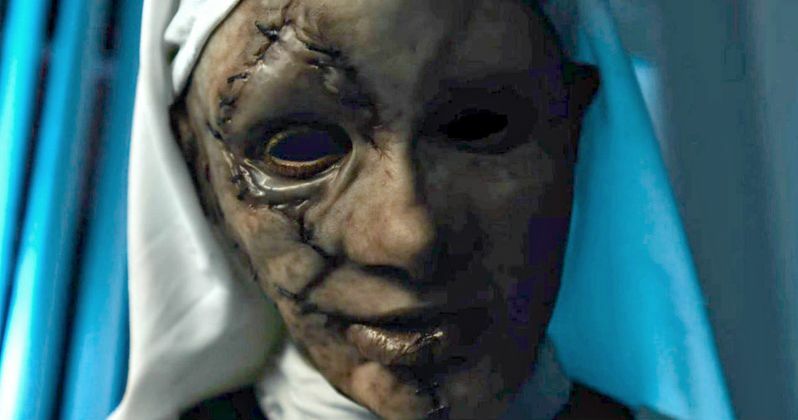 The Nurse absolutely feels like something that could exist within The Conjuring universe. The short features a girl who is recovering from an unknown injury in a suspiciously dark, creepy hospital. She has bandages on her eyes as a result of said injury, which Julian Terry uses to create some extra chilling moments. The whole thing culminates with a vision of a terrifying nurse who is the last thing anyone wants to see when they hit their call button during a hospital stay. This short looks really impressive for something that was shot in just four days. This seems to take some inspiration from the demon nun Valak that was featured in The Conjuring 2, which will be the subject of a spin-off titled The Nun next year. David F. Sandberg broke out last year with his horror hit Lights Out. As it turns out, he actually got his start and was allowed to make that movie because of a short film he made of the same name. The short made the rounds online and won some awards, which got the attention of some folks in Hollywood. That led to James Wan producing the movie, which was a huge box office success. Sandberg then took over the Annabelle franchise, which has turned out to be another great movie. Annabelle: Creation has already made $83 million at the box office and is a dramatic improvement over the first movie. Now, he is moving on to direct Shazam for the DC Extended Universe. That is an impressive resume for a guy who started with a short horror movie. The point being, a big career can start with something very small like The Nurse. One also has to wonder if New Line would actually consider making a feature-length movie based on this video. They are already planning other Conjuring spin-offs like The Crooked Man. If they can find a way to fit The Nurse into that mythology and if Julian Terry has a pitch, who knows? One of the studio's most promising directors started in the exact same way. Be sure to check out The Nurse for yourself below.